PUNE: The Athletics Federation of India (AFI) said it has not granted permission to the Pune International Marathon, and advised participants to skip the "unrecognised" event. The 32nd edition of the Pune International Marathon is scheduled to be held here on December 3. In a letter to its affiliated states, units and coaching camps in the country, the AFI said, "This is to inform you that Athletics Federation of India has not granted permission for Pune International Marathon." Some athletes had approached the AFI about the status of the Pune International Marathon event, it said. "They have been informed that Pune International Marathon is not recognised by Athletics Federation of India," it said. "You are strongly advised to skip the unrecognised marathon as AFI is unsure regarding the course measurement. AFI is concerned regarding the safety of all participants as AFI officials are not part of the unrecognised marathon," the letter said. 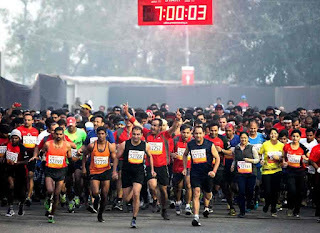 The organisers of the marathon expressed surprise over the last-minute letter from the AFI, and said the event will take place as per the schedule, and they have necessary recognition from the Association of International Marathons. "All the participants from other countries are on their way to the city and the marathon will take place as per its schedule," said Pralhad Sawant, Secretary, PIM. On AFI's letter, he said PIM trustee and president of Maharashtra Athletics Federation Abhay Chhajed will talk to AFI officials about the issue. A PIM office-bearer said AFI had similarly refused to grant recognition to the Pune Marathon two years ago too. PIM, the brainchild of former Congress MP Suresh Kalmadi, is being held annually since 1983.